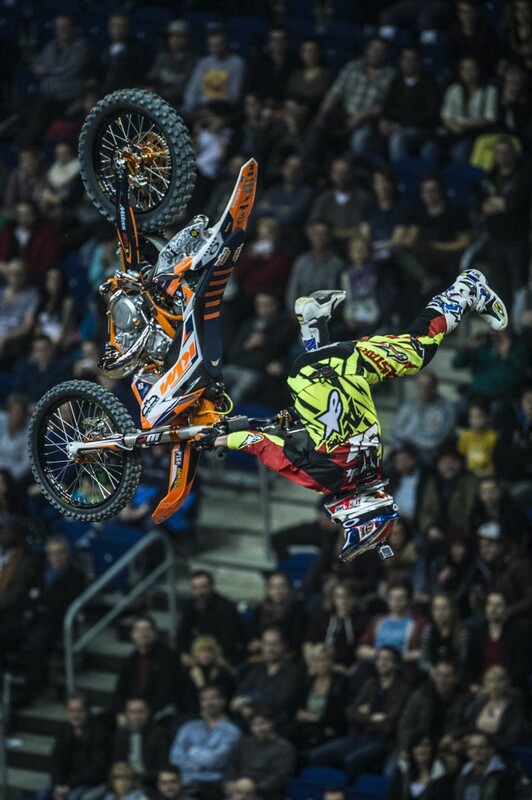 Freestyle Motocross evolved out of playtime. Mainstream pro MXers would ride in their free time, off-season, on some piece of off-road ground that happened to facilitate air. As is the wont of all bikers, such playtime would become a competitive group activity, in which riders would try to stay in the air longer, further, higher. Then it became all about the Backflip and whether such a thing could even be done on a motorcycle. Whoever was the first rider to actually do it depends on whose Wikipedia page you read, but the consensus is that Freestyle MX was born shortly thereafter, and in the late 1990s events sprung up like the Gravity Games and the Summer X Games in which Freestyle MX was a sub-category alongside skating, BMX, snowboarding etc. From 2000-2005, Freestyle MX evolved into its own branch of motorcycle sport, with figures like Carey Hart, Mike Metzger and Travis Pastrana vastly expanding the repertoire of possible tricks and making the Backflip seem so last year. 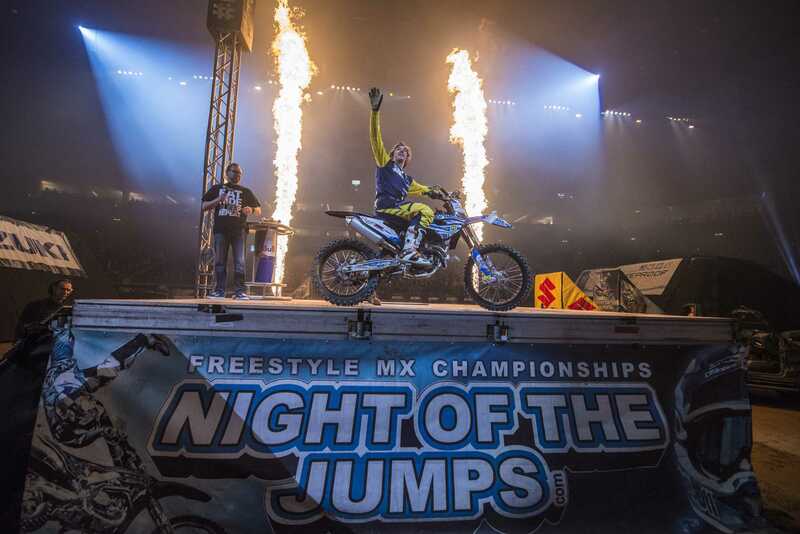 It was during this period that dedicated Freestyle MX events also started to gain traction, one of which was the Night of the Jumps in Germany. 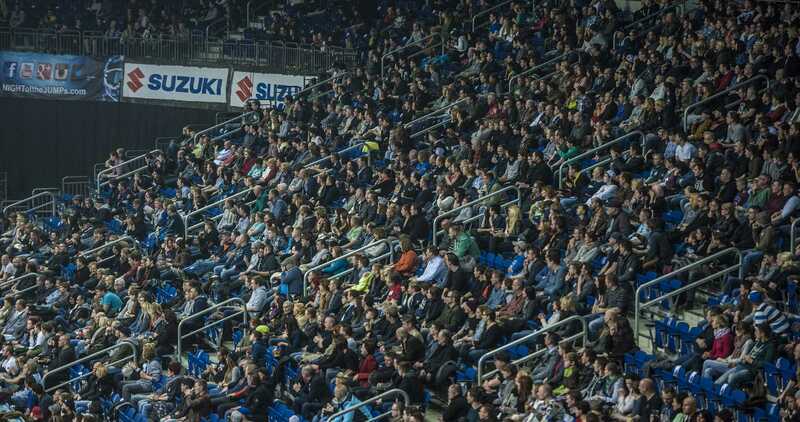 It started in 2001 and has been running every year since, with official recognition from the old men in blazers being granted in 2006 with the inception of the FIM World Freestyle Motocross Championship, which the Night of the Jumps organisation has the contract to run and promote until 2021. This means that NotJ as a brand, and by extension Freestyle MX, is now global. NotJ has spread to other countries, most notably with an extremely successful recent foray into China; but more importantly for us Brits, there is a round coming to London’s O2 Arena later this year. 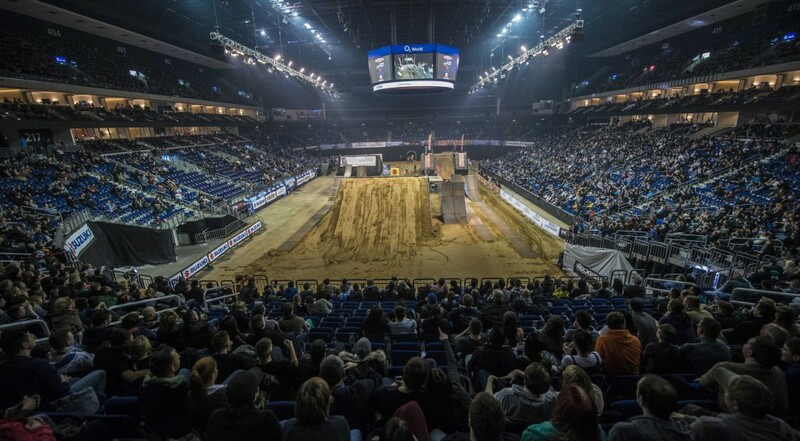 Which makes it all the more odd that prior to writing this article, Freestyle MX had never really registered on my radar; but then at the end of February, I got an innocuous-looking two-liner in my Inbox which consisted of an invitation to attend the Night of the Jumps in Berlin on 7th March. Fast-forward not more than seven days and I’m backstage at Berlin’s O2 World arena, getting the best intro to Freestyle I could possible have. Now that Night of the Jumps is essentially a touring event, it comes packaged in several trucks like a rock band on the road. To prepare for an event, the arena’s floor has to be covered with a protective layer, then another protective layer; then the actual riding surface is laid down using up to 1,800 tonnes of sand/dirt mix (720,000 shovels-worth). Just three days before NotJ, the arena was a basketball court, and the 25-man construction crew takes just 12 hours to build the track and the jumps using scaffolding which is laid out with a high degree of precision – the distances between the take-off and landing ramps is precisely calculated to produce exactly the required jump duration and height, as long as the riders approach them at the right speed, which given that MXers have no clocks, is achieved entirely by feel, instinct, experience and intense mental preparation for each jump. That’s the physics behind it. The entertainment side is provided by lights, fireworks, flame guns, a liberal application of hot babes and even a mountain bike demo and a German heavy metal band during the interval. The whole show as a spectacle is an antidote to certain other branches of motorcycle sport that pay lip service to spectators and only regard them as income streams; and in freestyle, the riders are judged on their interaction with the crowd during their routine. As a spectator you’re made to feel part of the show, and it’s a show that is also an antidote to the unspoken factionalism that permeates every facet of motorcycle culture because the show isn’t even really about bikes at all, it’s about the riders that fly them. I met a few of them backstage and got a close-up view of the bikes. Aussie Rob Adelberg is your archetypal extreme sports exponent: young, fearless, intensely chilled, but with the twinkle in his eye that comes from playing with the force of gravity as a job instead of working in an office. Fellow Aussie Steve Sommerfeld has been involved with NotJ since the early years, gradually morphing into the series’ spokesman and even competing for the first time earlier this year alongside his other work as a rider manager and all-round MX ambassador. At the age of 30 he suspects he’s past his peak, but compared to German 17-year-old wunderkind Luc Ackermann, everyone is past it. Ackermann is referred to in hushed tones of respect – he’s the Marc Marquez of freestyle: born to do this and so effortlessly talented he appears to need just one attempt to master a trick. All the riders are interesting people because they are allowed to be. Other sections of the media might influence you into thinking the riders are a spinoff of surf/sk8r culture, and that they are to be found backstage skinning-up and calling each other brah, but nothing could be further from the truth. That sort of assumption is a result of the sport’s origins in the Summer X Games in the mid-‘90s. Admittedly, in the early years of Night of the Jumps there may have been tendencies towards a party lifestyle in which some of the riders may or may not have shown up under the influence of [classified], but not anymore. Just as in any other branch of professional sport, this lot are professional athletes, are as dedicated to fitness and as prone to injury as all racers (and are also as prone to showing off their injuries too – ask Adelberg to show you his ex-scaphoid and his ankle). Furthermore, during the show the riders all get to ride along to their own personal soundtrack. It’s that personality thing again. it’s not forced, it’s not cleared in advance by lawyers; this is the sort of music they like, be it gangsta rap or heavy metal. You meet them either backstage like I did, or at the Pit Party meet & greet thing, and you expect them to be surrounded by walls, fences and barriers, and they’re not. You end up talking to them all as if you’ve known them for years because of that common language that we all speak – the language of Bike. You feel that you could go on a rideout with this lot and have a pint afterwards. You could hang out with them. If you want to hang out in certain other branches of motorcycle sport, well, you just can’t so forget it. The bikes are not prepared according to a complex set of regulations, because there essentially are none. The FIM‘s mandates concerning the motorcycle cover less than one page (in fact the first line of the bike regs refreshingly states: “the rider can adapt his motorcycle to his own liking and assumes all risks“). All bike prep is done according to rider taste and individual requirement, for instance Spaniard Maikel Melero is the only one who cuts a slot in his seat to use as a grab handle when in mid-air. There are some common themes though: the foam in the seats is shaved down to produce a flatter, wider surface to move around on; the bikes’ suspension is beefed up for obvious reasons; more grab holes are cut into the plastic side panels; the handlebars are oversized and have the brace bar removed to make the Barhop trick and its derivatives (the Deadbody and the Lazyboy) easier; mudguards are shortened to create space for leg movement, and the footrests are oversized. The engines though, are virtually standard except for an exhaust tuned for maximum torque. Outright power is not the aim here, as too much power can be a hindrance to fine control. Both 4T and 2T engines are used, again purely based on personal preference. Don’t forget that the engine’s rotating masses are essentially another big gyroscopic force generator alongside the two wheels. Those gyro forces want to make the bike run straight even when it’s 30 feet in the air, but a rider can influence those forces by using the handlebars to ‘steer’ and the brakes to control the bike’s attitude. Knowing those traits, knowing how to make them work with you and having the presence of mind to make that assessment, is where the true skill lies. Hearing Steve Sommerfeld talk about this got me thinking about how neuroscientist types theorise how the brain’s perception of time can vary when subjected to maximum stress scenarios, like basic fight or flight, or landing an MXer off a massive jump. I asked Rob Adelberg what it actually feels like to be at the top of an arc, at the zenith, momentarily hanging in mid air with all the forces of the universe in perfect balance. “Time stretches out”, he said. “It feels like hours but you’re only up there for a second”. I asked him if that sensation, that buzz, that bliss, is what makes them all do it. That bliss is what they’re seeking, that sense of being at one with the universe and in orbit around Planet Earth just for a fraction of a second before Newtonian mechanics takes charge again. Some of them take it further and let go of the bike – the Rock Solid, the Flintstone, the Lazyboy Flip – completely relinquishing control of their destiny to Newton’s mates called Gravity and Inertia, then taking it back again – if they can. It’s never totally certain – not even they know for sure. They are sticking two fingers up to Newton’s Laws – playing with them, exploiting them for our spectacle and enjoyment. The definition of cool is effortless style, and landing a jump on the first beat of the chorus of Run DMC/Aerosmith’s Walk This Way is the coolest thing I have ever seen in my life. You can’t rehearse or control something like that: it is exclusively in the hands of cosmic confluence – physics, timing and the gods of elite skill. 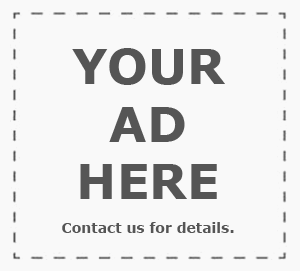 Message to accountants everywhere: you can’t buy that sort of thing, you can only feel it. The show itself works like this: first there is a qualification round, where each rider gets to do seven tricks within a time limit of just over a minute, all of which are judged on technical and artistic merit by a panel of judges who sit ensconced in a cordoned-off area in the stands, delivering their verdicts instantly via tablet devices (the judges all seem to have taken Serious Face Pills; they’re sat below me underneath our VIP box – I had to get that in – and not once do I see any of them smile). It’s the California Roll – the rider dismounts 30 feet in the air, walks round the bike, and remounts, then sits and takes his hands off the bars and lands the bike none-handed!!!! See, the genius of it is that the riders know that at the top of the arc they can fall off, lose grip, let go, but for that fraction-of-a-second-that-feels-like-an-eternity, they won’t go anywhere – they won’t fall down. Again that bloke Newton will tell you why. That brief window of time becomes their working environment where these incredible tricks are developed, and pro freestylers have the power to stretch that time into all the time they need. After the qualification runs, it’s the Lifeproof Best Whip competition, where the top five riders from qualification get to perform the Whip trick, simultaneously, all in the air at the same time, all playing to the crowd and to each other, to the max. It gets insanely competitive – style is the only thing that matters here: height, expression, drama, you name it. Luc Ackermann, the young German, wins it and the crowd goes absolutely ballistic in a refreshing show of unbridled partisanship. Then it’s Maxxis Highest Air, which has been won by Italian Massimo Bianconcini every year since its inception in 2012. This is a standing start from just a few metres away from a quarter pipe that hurls the riders pole vault-style over a bar that this year got up to 9.5 metres above the ground. It’s Motorcycle High Jump. Then it’s the Final. The top six riders from Qualification get to do their routines again, with the “Double Up” at the end forming the summit of the entire evening – the most dramatic, dangerous, and most importantly, stylish tricks of all. 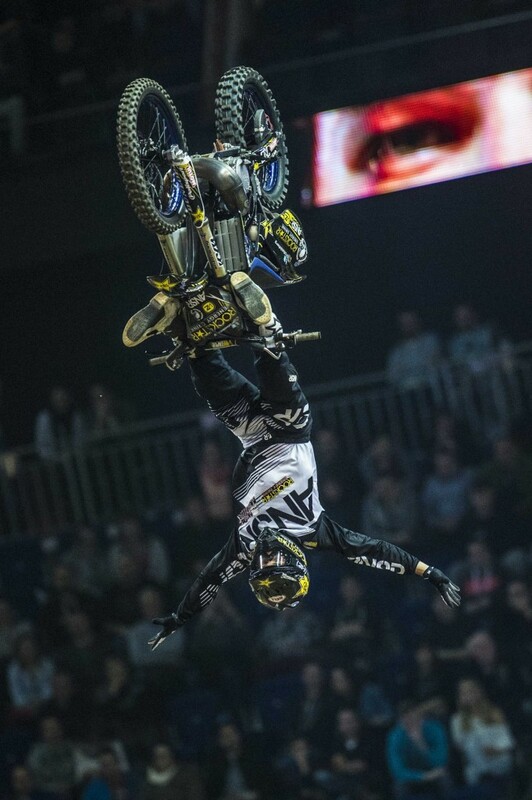 Adelberg impresses early on and sits at the top of the leader board for most of the final, then Frenchman David Rinaldo sneaks in and pulls off the most impressive tricks of the night; surely he’s won it? No, Maikel Melero rides last of all and wins the event by pulling off a routine that is so technically flawless that, while being no less impressive for it, seems muted in comparison to Rinaldo, Adelberg and the others; but it’s exactly like the racing adage that the fastest riders of all are the smoothest and look slow. It’s no disrespect. On the contrary, my respect for these blokes is total, for they live in a place that is only thirty feet above us, but it’s a place that is insanely difficult to get to and from where the world just seems to make sense. 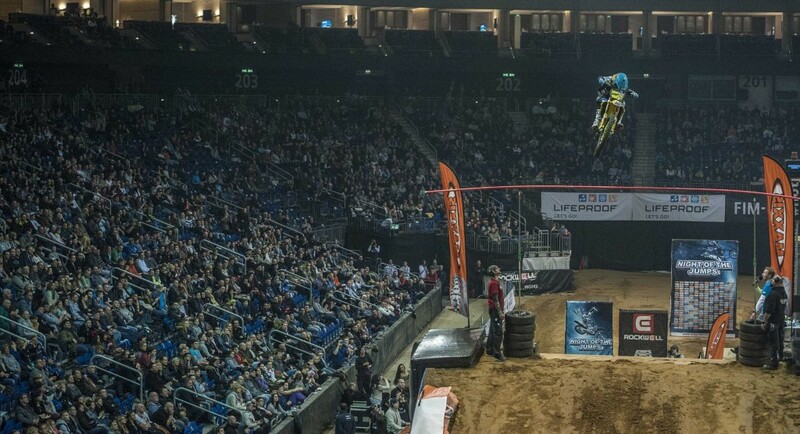 Night of the Jumps is at London’s O2 Arena on 5th September 2015. We’ll see you there! nightofthejumps.com for news, updates, ticket info etc.